Pine Street School offers rich, engaging after school programs for students throughout the Lower Manhattan community. All of our enrichment programs are open to students from both public and private schools and families in the region. We offer programming across all interests, including the arts, technology, and language. Spring Term Schedule (April 29-June 20***) Registration is open! After School Clubhouse - Mon-Fri, 3:00-6:00pm | Preschool (2.5-4y) or Elementary (K-5th) | $250/day/semester Register Limited availability! **Robofun classes run February 20-May 29; Session registration or weekly drop-in available. ***No class dates for Clubhouse, Chess, Tennis, Ceramics, STEM, Spanish & Yoga: May 27, June 14. Interested in bringing a NEW class to Pine Street School? Email us! This is a fun, relaxed social experience in which students play card/board games, read, do puzzles, do homework, snack and hang out. Supervised by staff. No electronics permitted. Allergy-safe snacks are provided. In this class, students will learn to build LEGO® robots around a central computer, that is the size of a deck of playing cards, called the EV3. They will learn how to attach motors and sensors to the EV3 and build constructions ranging from race-cars, to catapults and creatures. Students will program their robots to move, spin, and pick up objects. They will be introduced to ‘sensors’ that will allow their robots to respond to stimuli such as colors or obstacles. To test their skills, students may participate in tournaments and games, such as navigating a maze. By the end of the program, our students’ pride in their ability to design, build and program their very own robot is sky high! Taught by Robofun. Friday options at our sister school, Battery Park Montessori. Click here for details. Take a journey into Spanish language and its cultures through the magical world of music. With Canta y Baila Conmigo™ you and your child will be transported as you sing, dance and play along to the irresistible sounds and rhythms of Spanish speaking countries. Canta y Baila Conmigo™ is a unique curriculum with dual, complimentary goals of music education and language immersion. Designed for beginners and native speakers alike, Canta y Baila Conmigo™ creates a playful, interactive atmosphere where language learning is integrated naturally and organically in the musical experience. While children are effortlessly absorbing and using the Spanish language, they engage—along with their grown-ups—in age-appropriate explorations of melody, rhythm, movement and instrument play that help nurture a strong foundation in music literacy. Very fun and engaging Spanish class taught by one of our very own Pine Street School teachers, Stephanie Velez. Children will learn Spanish words relating to the topic of the day through books, visual aids, games, and songs. The class often makes crafts relating to the theme and also periodically enjoys some simple and allergy friendly Spanish cooking. The integration of art in a child's development can advance creativity and imagination while refining important motor skills. Clay is an enthralling and tactile medium for children to express their artistic creativity. Students will learn basic skills in hand building pottery. We will introduce a new project or idea each class, presenting different clay techniques the children can use as a starting point to create a piece of art that is all their own. Taught by Created by Kids. The Karma Kids Yoga philosophy of teaching yoga to children provides kids with a variety of yoga tools that they can take away from yoga class and use throughout their lives. Animals, nature and other objects come alive in our classes; as we move, we learn to stretch our bodies in new creative ways. Through basic and challenging yoga poses, partner poses, group poses, yoga games, mindfulness activities, music and stories, we promote strength, flexibility, coordination, and body awareness. Breathing and visualization techniques teach focus, relaxation and self-control. The Karma Kids Yoga program also promotes inner-strength, confidence and self-esteem; a feeling of well-being and respect for others; and, love for one's self, inside and out. Super Duper Tennis brings the FUN back in the game of tennis for kids ages 3 years and up by transforming unconventional spaces into sized-down portable kids courts - with equipment fit for your child - to make the game more accessible, enjoyable and easier to learn. We focus on teaching the FUNdamentals of tennis in an educational and exciting environment that enhances self-esteem, builds confidence and overall love for the game. Our teaching techniques are simple with tennis terminology that kids can understand and relate to. 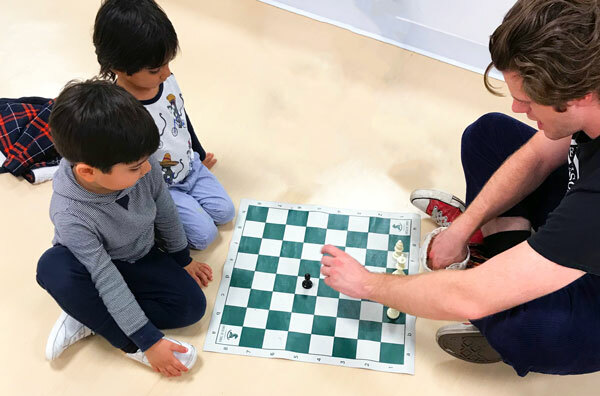 Our progressive, game-based curriculum is taught by our energetic, engaging and passionate coaches who strive to ensure each child improves their skills, is successful when hitting and has super duper fun! The core of our curriculum also focuses on developing the ABC's of tennis - Agility, Balance, Coordination, Speed and Strength - within the framework of tennis in order to build great athletes. Our overall goal is to ensure each child leaves each session motivated, educated and eager to return for more of the super duper experience! Swimmers are met at Pine Street School by Physique Swimming staff and travel to the pool at 25 Greenwich St (Leman Manhattan Upper School). Group and private lessons are available. In NORY Science & Engineering, we teach students "why" then "what" to help them become more inquisitive and to show them how to look at the world differently. Through hands-on experiments and collaborative projects, our class not only builds a foundational understanding of science and engineering but also a love of each at an early age. The course covers brand new topics such as: exploring non-Newtonian substances that change state with pressure and investigating the properties of crazy potions, helping to demonstrate chemical reactions. Along the way, children learn about the Scientific Method using a controlled variable and study the method of the design thinking process. Families receive a weekly recap note, that highlight key learning points, to help keep track of how their scientists are progressing.